The establishment of four major feast days to honour the Blessed Virgin Mary took place in the days of the apostolic era and have a significance in the Greek Orthodox Church which has remained unaltered through nearly twenty centuries of Christianity. The mother’ of the Son of God is honoured on March 25, the day of Annunciation when the Archangel Gabriel told Mary she was to become the mother of Jesus Christ; the Repose of the blessed Virgin Mary on August 15; on November 21, the Entrance of the Blessed Theotokos to the Temple; and on February 2 when the Mother of God brought the infant Jesus to the temple for presentation forty days after His birth. A fifth day of commemoration is celebrated on September 8, honouring the Virgin Mary on the day of her birth. This day was set aside by the Orthodox Church in the early first century, but not observed until the eighth century when Pope Sergios saw fit to join with the Orthodox during his reign which extended from 687 to 701 AD. All of Christendom agreed on the date that the Virgin Mary was born, but for some reason the date was not an official feast day in the Roman sector for more than a third of the length of existence of the Christian Church. The lack of communication between East and West ended in the Schism of 1054, a break which now appears to be an ever-narrowing gap, hopefully to be closed in a reunion upon which the Mother of God is sure to smile. The familiar story of Mary’s birth has had variations in splinter groups of Christianity, but there is no doubt that her birth came about as an act of God. Her parents, Joachim and Anna, were childless and were fast approaching the years which would place Anna beyond the age of childbearing. Perhaps it was because of the intensity of their prayers that a child be born to them that their prayers were not only answered, but their child would, in turn, bear a child ordained by God as his Son. 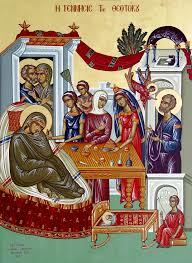 No one who calls himself a Christian can accept the virgin birth as anything but an act of God. Although Mary is known as the mother of God, she has been accorded numerous titles in the Orthodox Church of which few are aware. They include, in addition to Mary, Mother of God: The Repose (Koimesis) of the Blessed Virgin, Mary Pantanissa, Mary of Tinos, Mary of Malcheon, and Mary Vlacherne (just to mention a few of the many honours applied to her name). Considered the Mother of Mothers and the Mother of all Mankind, she is venerated in a manner which helps to sanctify the role of motherhood and the preservation of the family as the only hope for civilisation. In an age of equal rights, the God-given right to motherhood, which is the mainstay of Christianity, is lost in a cloud of other ‘rights’ that have no meaning in the presence of God. Those who clamour for those ‘rights’ are not aware that there is no inferiority in women, proof of which is an approach to God and a reading of the Bible as a stronger document than any constitution. It is regrettable that the immaculate conception, not to be confused with the virginal birth of the Saviour, is a concept of the Mother of God which the Roman Church assumed in 1854 AD and with which the Orthodox Church is in total disagreement. This concept holds that Mary was born without the stain of original sin brought upon all mankind by Adam and Eve. But the Orthodox position holds that since Jesus Christ is God, he is, therefore the only one who is without the original stain. The point could be argued endlessly; but in spite of dogmatic differences, there is no lessening in the adoration of Mary as the Mother of God. There can be no doubt that she was made pure on the day of the Annunciation when told by Gabriel she was going to be the Virgin Mother of the Messiah. The Orthodox position stems from the concept that if the immaculate conception is taken literally, then Mary would assume the stature of goddess alongside God. The popularity of the name of Mary attests to the glorification of the Virgin Mary. The Greek Orthodox can feel exultation from calling out the name “Panagia” which means ‘All-Holy’ and is the Greek word for the most sacred figure in Christianity, aside from the Son she mothered. Sunday before Holy Cross. Matins and Divine Liturgy.